Past Pupil Reunion & Fundraising Day 15th April, 2017. Past Pupil Reunion & Fundraising Activity Day Saturday, 15th April, 2017. Leisurely Boat & Walk; Killarney Lakes & Gap of Dunloe with Donal ‘’Dux’’ O Donoghue. Our Goal: – Refurbish the old Handball Alley’s. All monies raised will be used in the refurbishment of the schools old handball Alleys. We aim to transform the area into a modern roofed indoor area with a high tech AstroTurf floor. This all year round facility will provide the school with further indoor recreational and training facilities. A specialized kicking/hurling skills wall will feature as part of the upgrade. Please contact the school office to book tee times, walking or cycle activities. 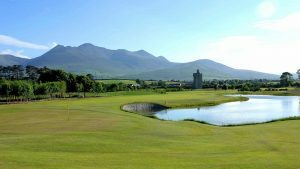 Beaufort Golf Resort is an 18 hole parkland course, situated 7 miles from Killarney nestled amongst 200-year-old trees, 15th century castle ruins, beautiful lakes and rolling meadows, uniquely surrounded by the magnificence of the MacGillycuddy Reeks. Tee Times: From 7:30 a.m. to 3:30 p.m.
A strenuous mountain hike/scramble over Ireland’s highest peak; Corrán Tuathail, this outing will be limited to 25 participants, travelling in small groups of 8 to 10. The journey will set out to ascend the peak out of An Com Cailí (The Hag’s Glen) before then traversing westwards over the third highest peak, Cathair na Féinne and dropping down into Glencar. The trip will be explore the riches of the natural and cultural riches of the Reeks and numbers will be strictly limited and open to those prepared for a strenuous day over rough ground. Sturdy footwear and appropriate mountain clothing is essential. (Pre-climb contact with lead-guide Con Moriarty required). Famous in one form or another over two centuries, “the Lakes” or “Gap trip” is on the doorstep of many who have never gotten around to making the journey. Leaving Ross Castle in Killarney by traditional boat, the hour-and-a-half journey will take us through the three lakes and rivers of the lake-system to the Black Valley in time for lunch at Lord Brandon’s Cottage. Thereafter, we will walk out of the Black Valley over and through the Gap of Dunloe to Kate Kearney’s Cottage. From St. Brendan’s College, this leisurely cycle open to all those of a moderate biking fitness we will explore quiet trails of the National Park and pass streams, rivers, waterfalls, lakes, beautiful oak forests, horse trails. We experience wildlife such as red deer, sika deer and white-tailed eagles. We enter the National Park at Deenagh Lodge, visit Knockreer House (panoramic views of the lakes and mountains), stop at Cloghmochuda ( a mass rock used in Penal times), cycle alongside Lough Leane to the fully restored Ross Castle built in the 15th century. We also visit the Copper Mines on Ross Island. We visit Muckross Abbey, a 15th Century monastery, and onto Muckross House, built in 1843, where a restaurant on the grounds gives us a chance to catch our breath. The profusion of pink and purple rhododendron bush in Killarney National Park, particularly in the gardens of Muckross House, is nothing short of stunning. The cycle will continue around Muckross Lake passing the Colleen Bawn Rock onto Brickeen Bridge to the Meeting of the Waters and the Old Weir Bridge. Onwards we cycle to Torc waterfall, cross under the main road and back to Killarney. Most of the cycle is off road and ideal for families. The cycle finishes at St. Brendan’s College. All cyclists will bring their own bike (suitable for hybrid or mountain bikes only, please bring rain gear ) on this trip that will be led by local guides, with a van/trailer back-up provided where access allows.